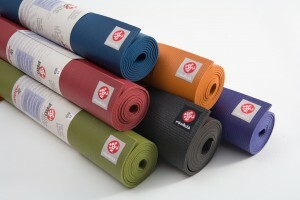 Yoga mat is the number 1 product to buy if you intend to practise yoga seriously. Here are some reasons why you need to have your personal mat: For many people, pressing their palms, knees, elbows, and vertebrae onto the bare ground or floor can be painful. Having additional support enables them to more comfortably perform the pose. A mat can act as a means of absorption if one st arts sweating during their practice, as well as a means slipping prevention. This is definitely the case for “hot yoga” classes, where the room is heated to 40 degrees. More importantly, every time you practice your yoga asanas you generate energy and this energy goes into the yoga mat. You want to keep this energy flow to yourself and not get someone else’s energy mixed with your own by using another person’s mat. If you don’t yet have your own mat, you can bring a towel to the class to cover a studio mat until you’ve gotten your own. There is a wide choice of mats at our studio. The best are Manduka mats and you can buy them here (our studio’s price is actually cheaper than if you order online because you don’t have to pay for shipping). Yoga towels are used primarily for two purposes: To place on top of a yoga mat to improve grip and traction, and to wipe away sweat (especially in a hot yoga environment). Yoga towels have become increasingly well-liked in the Yoga community, pro viding an absorbent, safe, non-skid practice surface area and lots of other advantages at an affordable cost. The main purpose of the specifically developed and rather expensive material would be to absorb lots of dampness whilst allowing air to pass through. 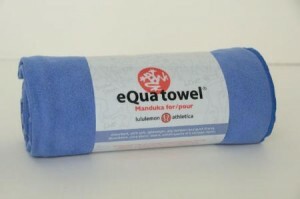 It is very useful as it fights bacteria, helps stability, absorbs moisture. A yoga towel is really a fantastic journey accessory that can be placed on any mat and instantly make it personal, saving the trouble of touring with a bulky yoga mat. Hot Yoga practitioners would appreciate their yoga towels’ absorbency throughout sweaty workouts and guarantee security and luxury. Yoga blocks and straps are considered to be the most widely known and used props in yoga. The main function of yoga blocks is that they aid yogis and beginners to get into postures and stances that they would otherwise find difficult to do. 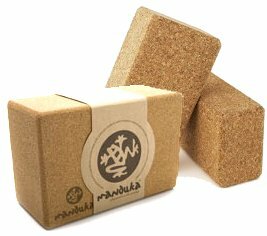 Yoga blocks are excellent props especially if you still haven’t developed the flexibility and suppleness that most yoga asanas require you to have. They also help individuals feel comfortable while performing their exercises as well as help improve their body alignment. With the aid of yoga blocks you can now stretch, strengthen and align your body without causing much strain to the other muscles. Yoga Straps may be made either from nylon or cotton. They let you to hold your limbs that you might not be able to reach or grasp in a pose. They also help you hold a pose longer. Yoga Straps are especially helpful in bound poses when your hands cannot reach the other as also in poses in which you have to hold your feet but can’t reach. Yoga bolsters offer several benefits for yoga students of all levels of practice. Bolsters can provide support in the asanas. Depending on the pose and type of yoga practice, yoga bolsters can be used to provide support. Your teacher may offer guidance or you can just use bolsters in any area where additional support is needed in a certain asana. Bolsters help you achieve proper alignment in the poses. Yoga bolsters used under the hips, knees, neck or buttocks, depending on the pose, can help improve alignment in the asanas. Whether you need support because you are having difficulty achieving the correct alignment or to support you to get into the full pose, bolsters can help you get there. 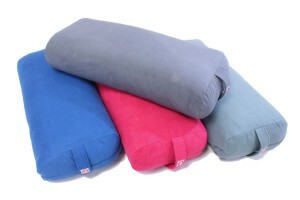 Using a yoga bolster relieves tension in the body. If you are having trouble with tension in the muscles that is preventing you from performing a specific asana, try a bolster. The additional support and correction in alignment helps to reduce tension. A yoga blanket helps you to feel relaxed and comfy that is indispensable in Yoga practi ce. Yoga Blankets offer warmth and provide cushioning to the Yoga Mat. The Yoga blanket can be used to sit and lie on during Yoga Session. The Yoga blanket can also be used to cover your body during Final Corpse Pose or Relaxation Poses, or whenever you feel cold. They can also be used as an aid in prenatal yoga classes and to help you get in the correct alignment in shoulder stand.